Gujarat Fortunegiants managed to get the better of Haryana Steelers in the match at the Rajiv Gandhi Indoor Stadium in Vizag on Wednesday. 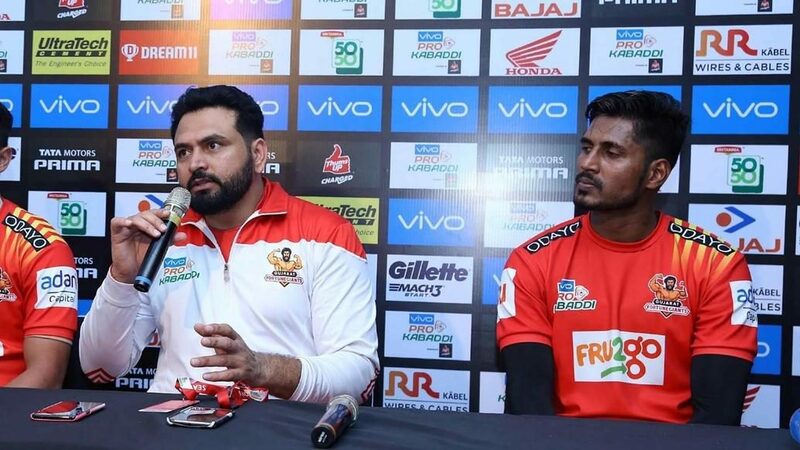 With a score of 47-37, it was a comprehensive performance from Gujarat Fortunegiants and for that coach Manpreet Singh and the game's leading raider K. Prapanjan stepped in to address the post-match press conference. Q. Both the defenders and the raiders performed well. What do you make of this match? Manpreet Singh: We were confident that we would win this match by a good margin. The raiding and defence departments played very well. There were a few minor errors, but they will always be a part of kabaddi. You can't eliminate them, no matter how much you practice. From the time the match started till the half-time, the defence and offence played very well. After that the defence was a little loose in places but in the final few minutes they upped their game again. So, overall the players played very well and for the coming matches the team has given us the belief that we have to win with a healthy margin. Q. There were a few mistakes from the corners. What did you tell them to improve their game? Manpreet Singh: See, these two corners have been doing very well since the league began. But against Haryana Steelers there's not much of a difference between our teams. They are the students of the same coach (in Haryana) - they have played together, grew up together. Both our teams have similar skills and players. Because they all belong from Haryana and our team's defence and raiders also come from there. So they play against each other so they know who is going to do what and where. The two corners we have, one is from Karnataka and the other from Maharashtra, so to build up the combination and coordination has required a lot of hard work. So when they err, the message for them is whatever practice and work you have put in, all your strengths and coordination, play on that. More than the bonus, focus on the catch. But they have played very well, and hope that continues. Q. Prapanjan, you got a Super 10 and so did Sachin. Can you tell us about the partnership between you two? K. Prapanjan: Super 10s are not as important as the team winning. That Sachin and I both got Super 10s shows the team's coordination in the match.